If your printouts are coming out a little streaky or subpar, it might be time to replace your ink cartridge. The issue could be a clogged or a misaligned print head. Sometimes, you may also get the message “printhead missing” or “printhead not installed”. Thankfully, the steps to fix problems like these are simple. Check out our easy troubleshooting tips below. We’ll help your printer deliver high quality prints once again in no time! You may be asking yourself, “What is a printhead?”. Well, the printhead is the part of the ink cartridge that applies ink onto the paper. In other words, it ‘writes’ the characters and ‘draws’ the images on the page. Press the tab on the cartridge to release it. Typically, this will be a step-by-step process inside your printer’s instruction manual . Follow the instructions to locate the section about the printhead. There you will find out how to properly install and align it. Wipe the electrical contacts areas. Do this until they are fully clean. This video demonstrates how to clean the printheads and clogged cartridges in detail. Bonus! It also claims to work for most popular printer brands and models. The above video shows you where the printheads’ location. It also demonstrates a simple way to clean them. Meanwhile, you should also check the ink levels in the tank(s). They might need replacing. Explore the hardware tab to find the cleaning tab (this may also be under the maintenance or services tab). 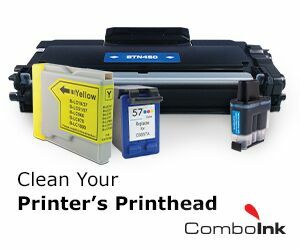 Ensure that your ink or toner cartridge is properly installed and aligned. Perform regular maintenance checks as recommended by the printer manufacturer. Use your printer regularly and keep it clean. Most clogging and drying problems occur because of dust or grime; or due to infrequent use. Keep the printer in a dust free area. Print an occasional invoice here or photo there to avoid drying of ink and clogging of the heads. Still have a print problem? Or do you a different problem that you’re not sure how to resolve? If so, you may want to check out some of our Troubleshooting tips. You are likely to find solutions to most common printer cartridge related problems here. If you still have questions or need further assistance ComboInk is here to help. You can try contacting CI’s Customer support with any troubleshooting questions. Call us Toll Free at 1.877.786.1266 or get in touch via our Contact Form.